Every pet is different. 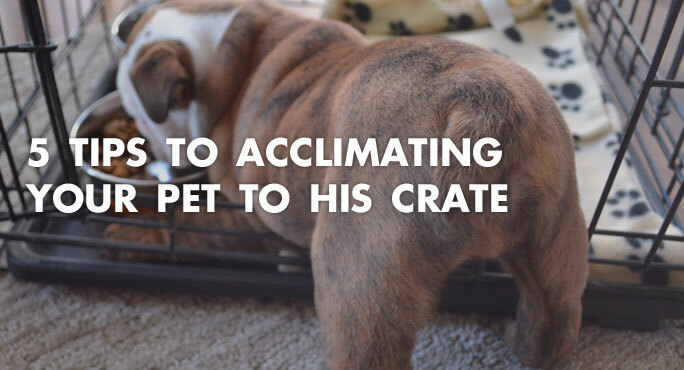 Yours may take to his new crate easily, but you don’t want to leave that to chance. Below, you will find some useful tips to help in the familiarization process. Dogs have an ancestral cave instinct. We humans would probably feel disturbed being cooped-up inside a small place for a period of time, but for dogs, being inside a crate makes them feel secure and safe. They are in their “cave.” Once your dog is fully familiar with his travel crate, it will become his personal cave. He will experience many new sights, sounds, and smells during his journey, but all from within a place that feels reassuring and secure. Cats don’t have that same cave instinct, but they are very partial to their favorite spaces. And most cats don’t like change. So it’s equally important to help your kitty come to see his crate as his new favorite space. During the first week, feed your pet his meals inside the crate, leaving the door open. You can also encourage him to enter and explore the crate between meals, by placing treats or toys inside or on the top. Cave instinct aside, some dogs are afraid of enclosed spaces. If that’s your guy, start with just the bottom half of the crate, so it looks like a bed to him rather than a trap. Encourage him to sit or stand in it while you lavish him with treats, petting, and praise. Feed him in it, too. After a few days, finish assembling the crate, leaving the door open as noted, and continue to practice “good times” in and around the crate. Throughout the second week, continue to feed your pet inside the crate, but close the door after he enters to eat. Open the door once he has finished his meal, or after 15 minutes. During the final week, continue to follow the Week 2 routine but have your pet enter the crate 15 minutes before you feed him. It is extremely important that your dog associates his crate with fun activities or interesting objects. Every time he spends some time inside, immediately reward him when he emerges with praise and something he loves, such as a game of fetch, a favorite chew toy, or going for a run. For travel, you will need to put something soft and absorbent on the floor of the crate. Your pet’s favorite small blanket or something similar is best, because it’s his. Second best? Something that smells like you. That might be a T-shirt, a towel, or sweatshirt – but don’t wash it because that will remove all the comforting, homey aroma. Consider putting whatever soft bedding you plan to use in the crate right away. That will give your pet even more reason to feel safe and secure inside, right from the start. We recommend you spend at least three weeks familiarizing your dog or cat to his crate. However, it’s best to start this process as early as possible, to give him maximum time to become friends with his new home away from home.